Pontuação dada pelos hóspedes após a sua estadia em The House in Old Mint Street. The apartment is super! spacious with high ceilings, the design is high level, very elegant look and respectful of the architecture of the ancient city. The location, the furniture, the freedom to enter and leave at any time, the cleanliness. Moreover there is a small kitchen, you can prepare yourself a good breakfast. They provide tea bags, coffee bags, coffee and milk in capsules every day. There is an electric kettle in addition to the coffee machine. there is a small shop. There is a small grocery store right next to the building so you can buy what you are missing. we really like our stay and the town is so beautiful. Clean, comfortable and very good location! Clifford was very helpful and kind, answered immediately to anything we asked/needed. If I come back in Malta, I will definitely stay there again. Great location, just round the corner from everything in Valletta! Nice and quiet too. This was a fantastic apartment right in the centre of Malta. We were given a friendly greeting, and the staff couldn’t do enough to make our stay comfortable. The apartment was cleaned and fresh towels left every day. The luxury of a hotel with the convenience of a self serving apartment! Would recommend and book again! A lovely apartment with hugely helpful owners (who were happy to arrange a late checkout). It is located right in the old city, so everything you may want to see in that area is within 10 minutes' walk at the most. The apartment is spotlessly clean, quite large given the location, and very quiet. It is ideal for business or tourism. The small kitchen is good for making light meals (but not ambitious meals). The good air-conditioning was welcome in a hot September. The internet connectivity is excellent. There is a very good shower too. Check in very efficient. Accommodations were very comfortable and charming. This property is in a great location, clean, private , like very much. Fantastic location in the heart of beautiful Valletta. 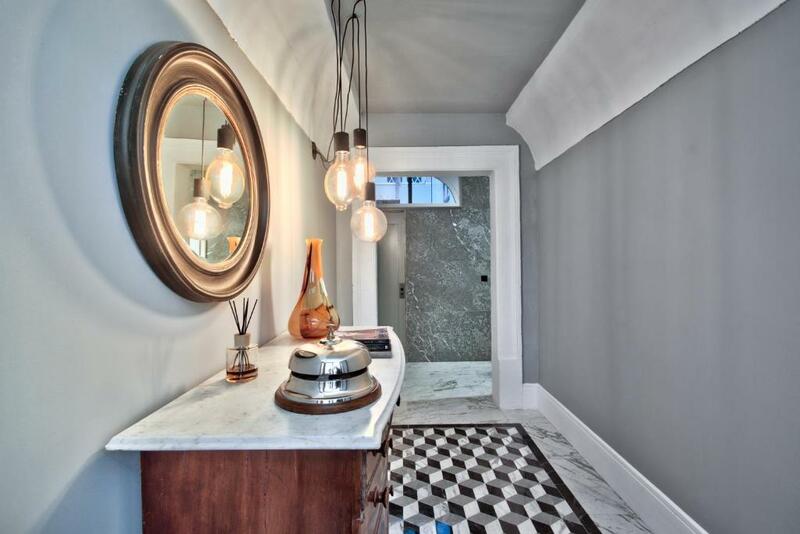 Spacious and very clean apartment with a super-comfortable bed and a luxe shower. Friendly and helpful owners. Ground floor = no stairs at the end of a long day. Amazing location in the centre of Valletta, Right around the corner from a great street for food and drinks. A nice location to spend the nights if you are visiting Malta and a nice building too. Lovely to have fresh towels each day, and also beach towels. Very helpful generally. Consiga um excelente preço em The House in Old Mint Street - pontuação de 9 dada por hóspedes recentes. "The apartment is super! spacious with high ceilings, the design is high level, very elegant look and respectful of the architecture of the ancient city. " "Clean, comfortable and very good location! Clifford was very helpful and kind, answered immediately to anything we asked/needed. If I come back in Malta, I will definitely stay there again." "Great location, just round the corner from everything in Valletta! Nice and quiet too." 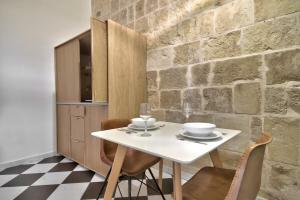 "This was a fantastic apartment right in the centre of Malta. We were given a friendly greeting, and the staff couldn’t do enough to make our stay comfortable. " "A lovely apartment with hugely helpful owners (who were happy to arrange a late checkout). " "Check in very efficient. Accommodations were very comfortable and charming." "This property is in a great location, clean, private , like very much." "Fantastic location in the heart of beautiful Valletta. Spacious and very clean apartment with a super-comfortable bed and a luxe shower. Friendly and helpful owners. " "Amazing location in the centre of Valletta, Right around the corner from a great street for food and drinks. A nice location to spend the nights if you are visiting Malta and a nice building too." "Lovely to have fresh towels each day, and also beach towels. Very helpful generally." Um dos campeões de vendas em Valeta Situado em Valletta, o The House in Old Mint Street fica a 80 metros do Teatro Manoel e a 600 metros dos Jardins Upper Barrakka. O apartamento climatizado inclui uma televisão de ecrã plano com canais por cabo, uma área de estar e de refeições, bem como uma kitchenette totalmente equipada com um micro-ondas e uma torradeira. As acomodações também incluem um frigorífico e uma máquina de café. São fornecidas toalhas. O Museu Nacional de Arqueologia fica a 300 metros do The House in Old Mint Street, enquanto o Museu Nacional de Belas Artes fica a 300 metros. O aeroporto mais próximo é o Aeroporto Internacional de Malta, a 6 km da propriedade. Este alojamento é recomendado pela boa relação preço/qualidade em Valeta! Os hóspedes têm mais por menos dinheiro em comparação a outros alojamentos nesta cidade. The House in Old Mint Street dá as boas-vindas a hóspedes de Booking.com desde 23 de Mar de 2017. Em que período gostaria de hospedar-se em The House in Old Mint Street? O apartamento climatizado dispõe de uma kitchenette equipada, de uma área de estar e de uma televisão de ecrã plano. Também inclui uma máquina de café Nespresso. As cápsulas Nespresso não estão incluídas. With years of experience hosting guests from all over the world, we are now pleased to welcome guests into apartments in our own house, The House in Old Mint Street. Extremely central, just around the corner from the gorgeous Baroque Manoel Theatre, Europe's third oldest operating theatre. Just in front of the iconic Lady of Mount Carmel Basilica, The House in Old Mint Street is few meters away from all commodities, coffee shops, restaurants and museums. Informação essencial The House in Old Mint Street aceita pedidos especiais -adicione-o(s) no próximo passo! The House in Old Mint Street aceita estes cartões e reserva-se o direito de reter um valor temporariamente no seu cartão antes da chegada. Por favor, informe The House in Old Mint Street antecipadamente sobre o seu horário de chegada. Para isso poderá utilizar a caixa de Pedidos Especiais durante o processo da reserva ou contactar a propriedade diretamente através dos dados para contacto providenciados na sua confirmação. "The apartment is super! spacious with high ceilings, the design is high level, very elegant look and respectful of the architecture of the ancient city. The location, the furniture, the freedom to enter and leave at any time, the cleanliness. Moreover there is a small kitchen, you can prepare yourself a good breakfast. They provide tea bags, coffee bags, coffee and milk in capsules every day. There is an electric kettle in addition to the coffee machine. there is a small shop. There is a small grocery store right next to the building so you can buy what you are missing. we really like our stay and the town is so beautiful." 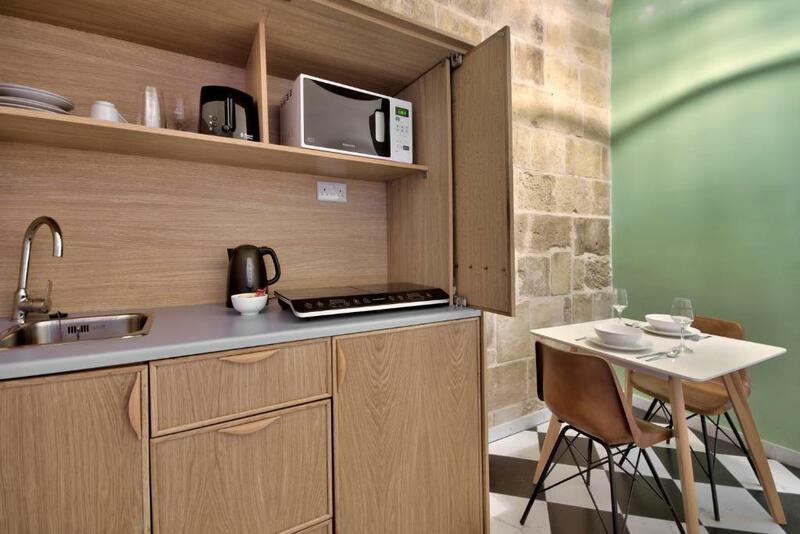 "This was a fantastic apartment right in the centre of Malta. We were given a friendly greeting, and the staff couldn’t do enough to make our stay comfortable. The apartment was cleaned and fresh towels left every day. The luxury of a hotel with the convenience of a self serving apartment! Would recommend and book again! " "A lovely apartment with hugely helpful owners (who were happy to arrange a late checkout). It is located right in the old city, so everything you may want to see in that area is within 10 minutes' walk at the most. The apartment is spotlessly clean, quite large given the location, and very quiet. It is ideal for business or tourism. The small kitchen is good for making light meals (but not ambitious meals). The good air-conditioning was welcome in a hot September. The internet connectivity is excellent. There is a very good shower too." "Fantastic location in the heart of beautiful Valletta. Spacious and very clean apartment with a super-comfortable bed and a luxe shower. Friendly and helpful owners. Ground floor = no stairs at the end of a long day. "